There are several versions of the pecan harvester. These devices range from simple to pretty complex. A thorough search of a local farm or hardware store will likely turn up a couple of varieties of pecan picker uppers. Nuts-About-Pecans.com even sells the best pecan harvester available. They are usually similar in design. They most often have some sort of device on the end of an approximately 2-3 foot long stick. You can hold the end of the stick in either hand and then trap the fallen pecans using the contraption on the other end. After you've picked up a few, they can be emptied into a bucket. These can be purchased from the web too, since stores usually only stock them later in the summer. 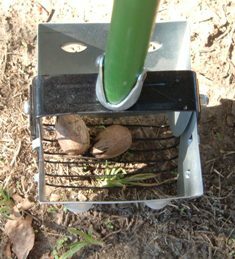 There are more elaborate pecan pickers that may help you reduce the amount of the time involved rounding up all of your harvest. I've seen some that resemble a push lawnmower in size. You wheel these harvesters around the pecan tree, gobbling up the nuts as you go. They are thrown into a holding tray that may be emptied periodically. Just remember, the more complex the device the higher the price. 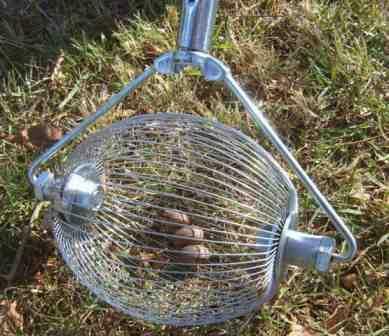 If you are gathering pecans from only a few trees you'll probably be just fine with one of the more simple harvesters. Have a half dozen pecan trees or more? You may be justified in looking into buying a piece of pecan equipment that will significantly cut down the number of hours you spend under the trees. Otherwise you may need to get lots of people to help you out. Invite over your friends, buy some extra pecan gathering tools and get to work. This is the type of pecan harvester I have used each fall. These can be purchased at a local hardware store or online. 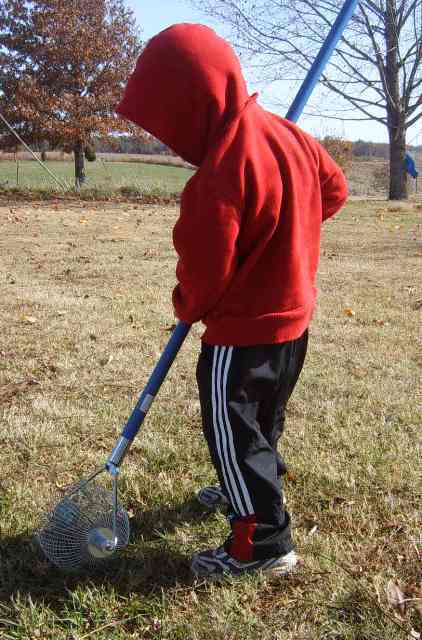 Our oldest, Ethan, loves to pick pecans with the picker upper! My parents, for several years, have used the type of pecan picker upper shown in the photo below. 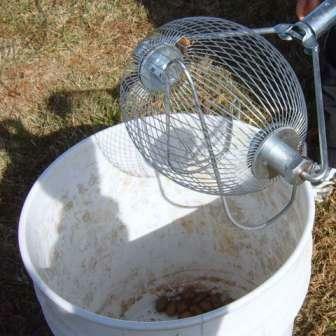 It is very similar to the pecan picking device we have utilized. In the fall of 2011 my mom came across an interesting pecan gathering product while dropping off pecans at a local cracking/shelling house. It is called the Nut Wizard and is now our preferred method of picking up the nuts. It will work with any type of nut and is available in several different sizes, capable of picking up everything from the smallest nuts to large tree fruits. We have made use of it extensively and it is really handy and a time-saver. Plus it is Made in the USA! You roll/push the nut wizard along the ground, over the pecans. The pecans pop into the cage and will stay there until it is emptied. You can fill up the wizard in just a few minutes. Our kids love using the Nut Wizard and usually end up in a scuffle to get to use it. It is easy to empty and comes with a small fixture that is to be attached to a bucket. Sometimes you will end up with a few pecans that are still in the hull so you might have to pick those out along with any other trash that might make it's way in there. Overall, however, it is a really great device! 1.) Its basket is constructed of wire that has twice the wire thickness. While other pecan gatherers have wires that tend to bend over time, the Pecan Broom resists such permanent bending. What this means for you is fewer dropped pecans and a longer useful life. 2.) 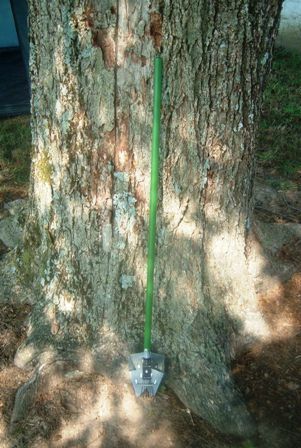 This unique pecan harvester offers a feature that no competitor does, a five piece handle that can be configured to various lengths to accomodate any height. 3.) This pecan picker upper uses 2 notched side plates. This plate locks the pecan gathering basket in place. 4.) This unit is repairable. Replacement parts are available by contacting us. To find out more about the Pecan Broom click here! You'll be taken to our exclusive Pecan Broom webpage which tells all about this hard-working product!